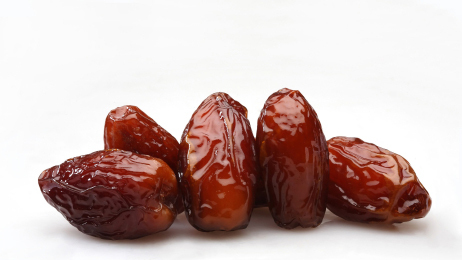 A daily dose of pomegranate juice and dates can do wonders for the heart. Archive photos. But if you’re tired of eating that Red Delicious or Royal Gala, chew on a shitake mushroom. 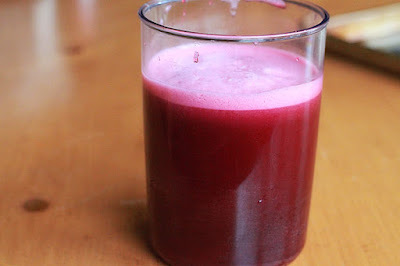 Or how about a cocktail of pomegranate juice and dates? According to two, separate studies the aforesaid can keep the medicine man at bay, too. First, the shitake mushroom. Essentially, the study showed that by eating one, four-ounce serving of the Asian fungus a day, 52 healthy adults between the ages of 21 and 41 had a stronger immune system. Of course, a stronger immune system makes a body less susceptible to illness because it can defeat many and various strains of viruses that might take it upon themselves to attack. Incidentally, the researchers disqualified vegans and vegetarians from the study. They also required participants to restrict their intake of alcoholic beverages because alcohol suppresses the immune system. Further, they asked participants to avoid foods, supplements and probiotics that strengthen the immune system. In a large cast iron pan add 1 tablespoon oil over medium heat. Add all the remaining ingredients and combine. Cover with a lid and place in oven for 30 minutes. Fluff rice when ready to serve. For dessert, consider a four-ounce glass of pomegranate juice, three dates and their pits. That daily quantity is the precise amount that will decrease the likelihood of hardening of the arteries, another team of researchers discovered. Hardened arteries can cause a heart attack or stroke, and high cholesterol is one of the causes of hardening of the arteries. 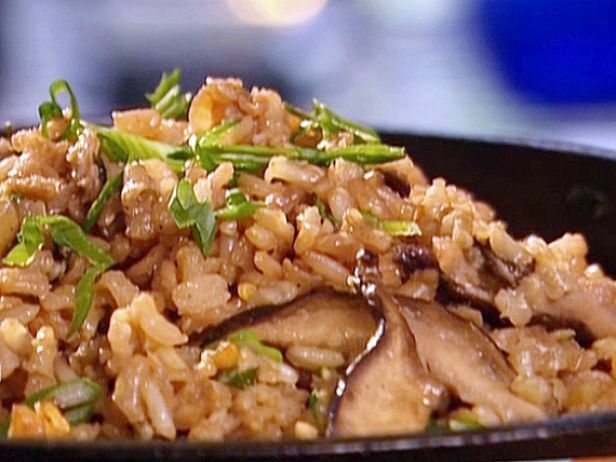 Shitake Mushroom Brown Rice. Yum! 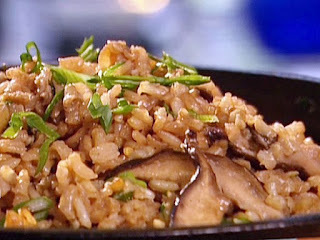 Photo courtesy of Food Network Web site. In this second study, one of the researchers asked a “what if” question to reach a life-saving discovery. Taking into account that both pomegranate juice and dates have cholesterol-fighting antioxidants, what would be the outcome if these two Middle Eastern foods were combined. And EUREKA! The two different strains of antioxidants worked better as a team than they did individually in lowering cholesterol. Visit http://www.bit.ly/1JdyIfV to learn more about the mushroom study; visit http://www.rsc.li/1NtVSCK to learn more about the pomegranate-date study.